Stachybotrys mold can be very dangerous because this organism can produce high levels of mycotoxin, which when breathed in can be harmful to human health. It is important to learn how to identify stachybotrys in order to prevent continued exposure when mold is present in a home or business. If you suspect mold is in your home, you need to have it removed right away. If you wait, it will just continue to spread and over time will make you sicker and sicker. It most commonly affects older people and the very young, but if enough of it is present in your home it eventually will cause health problems for everyone. We recommend you use a mold testing specialist to help you find all the mold, identify the type of mold that is growing, as well as determine the best cleanup processes. You can follow this link to get a list of Mold Testing Specialists in your area. 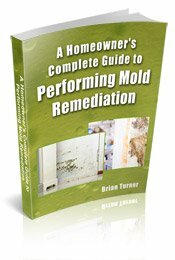 Many people make the mistake of trying to find and remove the mold themselves, only to learn later on that they missed some and their mold problem has now spread to even more areas of their home. Typically, Stachybotrys mold will grow on materials that are porous and damp. These types of materials are commonly used in buildings, such as wood, drywall, carpet, fabrics, and even insulation. If these kinds of materials become damp or wet, they may begin to grow mold within a short period of time. In fact, sometimes mold growth occurs as quickly as 24-48 hours after the dampness occurs. 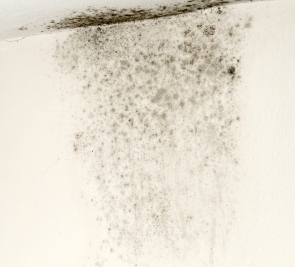 Because molds like stachybotrys grow in damp areas, you should start looking in areas such as the basement or bathroom. Both of these areas in the home may have a higher humidity and be prone to dampness. The bathroom is constantly becoming damp as people are showering, and the steam can result in mold growth on the walls, ceiling and floors. If you want to know how to identify stachybotrys mold in the basement, keep in mind that you should be looking anywhere that may have a porous surface. Basements are often moist because they are below ground, and mold growth can be prevented by using a dehumidifier to remove the moisture from the air. 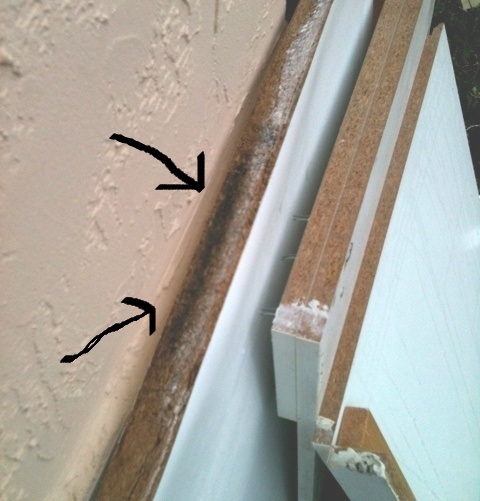 The photo above shows black mold that was found in the particle board of a bathroom cabinet. There was also some mold in the wall. After you have identified that a mold problem is present, it is best to begin the cleanup process immediately in order to prevent damage to your health. The problem lies in the fact that many people don’t understand the proper cleanup processes, and they may actually cause cross contamination within the building. If you are not a mold expert, it is a good idea to leave the mold growth alone until you have had the opportunity to talk with a professional who can assess the situation. The mold cleanup process should begin with identifying all areas of mold growth within the home. Next, those areas need isolated from the rest of the property to prevent cross contamination. Then the moldy areas are sprayed with a detergent, and then scrubbed in order to remove the mold. Porous materials such as carpet, drywall, insulation, etc. should be removed and thrown away. Wood can sometimes be salvaged by scrubbing it with a wire brush and encapsulating. An experienced mold removal professional will be able to tell you what is salvageable. The entire area also needs to be completely sanitized with an approved mold biocide in order to kill any spores that remain in the room. Do not use bleach or a general household cleaner, as they may not kill all the mold and your problem will just return. A mold removal specialist will have plenty of experience dealing with all types of mold, in all areas of the home, and they will have the equipment necessary to remove all the mold in a safe and effective manner. If the mold is just in one small spot that is easy to get to you may want to try removing it yourself, but since mold spores are microscopic and can travel to anywhere in your home, we recommend using a mold removal specialist to make sure you get it all. When a mold problem is identified in your home, the first step that you should take is to have a mold contractor come to do a free assessment. They will look at the situation, and use specialized equipment to find all of the mold present. Stachybotrys mold shouldn't be ignored, because it can cause serious health problems. It is important to take action as soon as possible. Follow this link for a list of Mold Contractors in your area that offer free home assessments. They will also give you a detailed treatment plan. If you decide to clean it up yourself, you will know exactly what needs to be done. Stachybotrys mold on wall and ceiling.